Most days now when I walk in the park near my home here in San Miguel de Allende, Mexico, I make a point of saying my thank-you prayers. I thank my God, the Great Spirit — not to be confused with that big old white guy in the sky pointing his forefinger, so indelibly depicted by Michelangelo on the ceiling of the Sistine Chapel five hundred years ago — for my many blessings. Among those blessings: legs that still walk, eyes that still see, the color of the sky – almost always my favorite shade of blue, the flame-hued bougainvillea dripping from stone walls, the tall and skinny cypress trees standing like sentries, the fan-dancing palm trees lining Parque Juarez’s paved walkways, and — now that it’s Spring again — the purple-flowered jacaranda trees towering overhead. Could any tree possibly be more beautiful than a jacaranda in bloom? Could anyone be luckier than to live in a place where jacarandas bloom in Spring? So with every step I count more blessings: this charming old park, those exuberant teens playing basketball on the center court, these toddlers on wobbly legs chasing elusive birds past young couples nuzzling on wrought iron benches, this row of vendors in mini shacks selling cool drinks and snacks, that danceable Mexican music from somebody’s boom-box, the fresh lushness of the vegetation on this warm afternoon, but, above all, these majestic, enveloping trees. 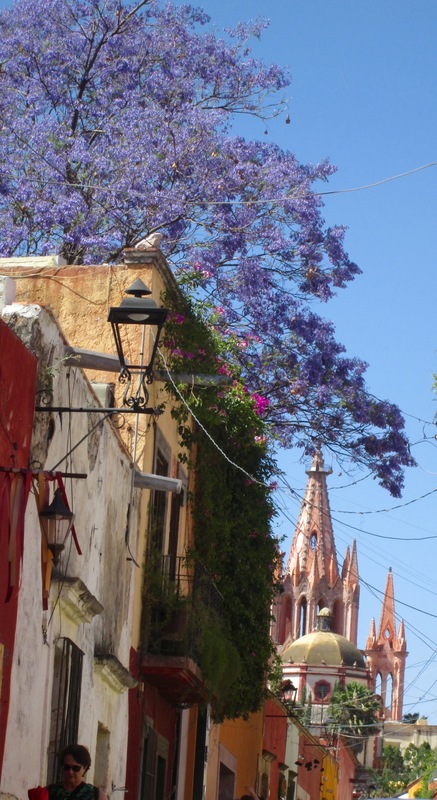 “In April and May, springtime in the northern hemisphere, the beautiful colonial city of San Miguel de Allende is dotted with an added color on its already color-filled palette – purple jacaranda (pronounced “HACK-ah-ronda” here) trees in bloom. Now, on my daily walks and explorations, I take pictures of these glorious trees wherever I go. Last January 1st, when I fell backward from a high ledge onto my tiled bathroom floor (see “After the Fall,” posted January 6th, for the whole story), I could well have broken my back or my neck or my skull. I could have been rendered permanently disabled. Immobile. Instead, I’ve been rendered indelibly grateful for my blessings. I’m not yet ready to dance, but I can walk. I can see. I can observe and admire this beautiful world around me. 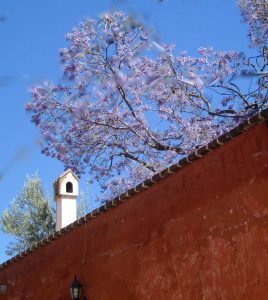 I can take inspiration from the towering jacaranda trees dressed for this most hopeful of seasons in delicate shades of lavender: I can learn from their juxtaposition of strength and fragility. And I know the Great Spirit hears my thank-you prayers. Thank you, Susan! My pleasure. I know I’ll feel that same gratitude when I see them for myself next year. Thank you, Bonnie, for witing about them again. I can’t wait! One full year is a long time to wait, Barb, but when you get here next year you’ll know the sight of these jacarandas will have been worth waiting for! Wonderful story and one of my favourite trees. Just a note about them, although tropical they don’t grow in Puerto Vallarta. They must need some cold too. We have the lovely Amapas trees blooming in pretty pink and yellow varieties know as Primavera, but no Jacaranda. Thanks Bonnie. Thanks so much for this, Donna. 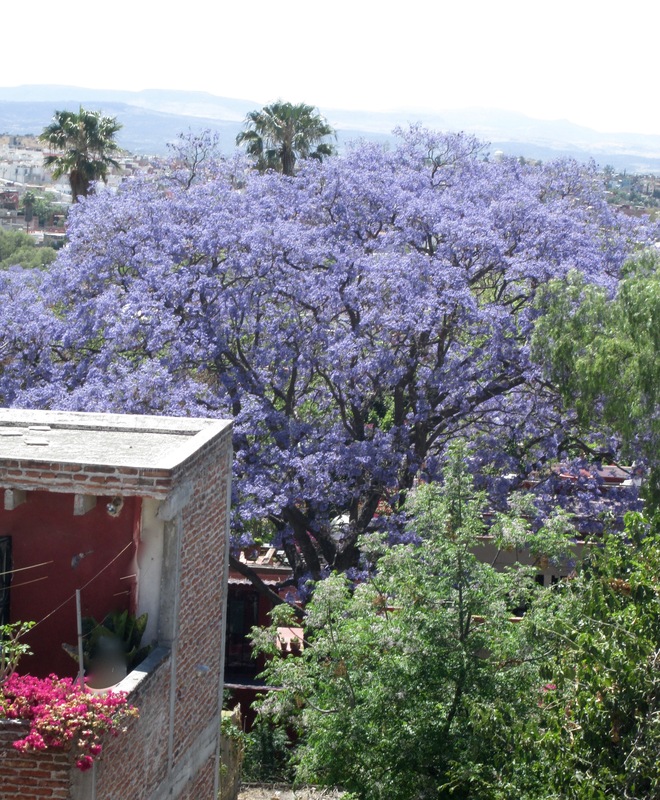 Yes, maybe jacarandas need altitude too — which they wouldn’t get in Puerto Vallarta! Beautiful photos. We should all be thankful for our health. I find myself the most thankful after I’ve been sick and I remember what it feels like to have it taken away in a small way. Thank you, Kristin. Yes, my overriding takeaway from that accident in early January is gratitude. Such a lovely description as usual. SMA will be my first planned destination next year. I promise. 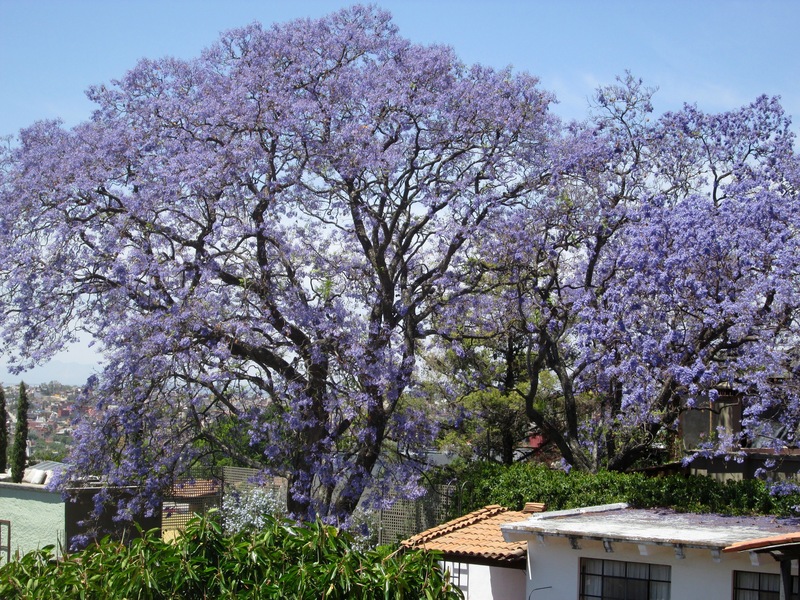 Yes, the jacarandas do inspire gratitude – for beauty, for life, or being alive. Thank you for bringing a little of SMA’s springtime glory to Sri Lanka with this post. 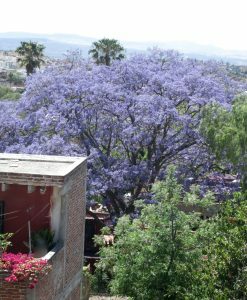 I was living in Guanajuato last year for the jacaranda bloom and it was truly spectacular. Thank YOU, Kim, for this note from Sri Lanka. 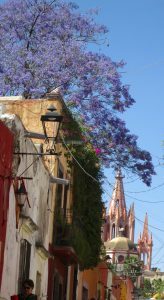 I’m in Queretero for a few days, and the jacarandas here, too, that line the wide streets are in full bloom. Such a glorious season in Mexico! This is a message we cannot hear enough. It is a blessing to have you and your words in my life.